If you like Doctor Who and robots then you are going to love this Emojibot ornament. As a true fan of Doctor Who you did recognize this robot from that episode with the 12th Doctor and Bill. And you can own this Emojibot robot for in your Christmas tree as it is an ornament that is 4 inches tall. Besides for Christmas you can use the Emojibot the rest of the year as room decoration to as it does not really have any Christmas details. Be careful as this robot is a bit scary and if you didn’t know that then go watch the episode with the Emojibot and the 12th Doctor Who. Christmas will be amazing if you have this 4th Doctor Christmas ornament. 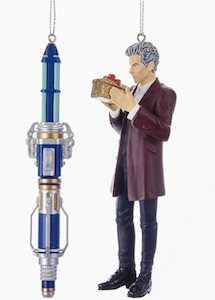 The Doctor Who ornament is about 5 inches tall and shows the 4th Doctor and he is taking his hat of for you and you can see him with his amazing long scarf with colorful stripes just like we remember him by and he also brought his Sonic Screwdriver. And as the ornament of the 4th Doctor Who is not really decorated for Christmas that means that you can keep him out the whole year round and just put him in the Christmas tree for the holidays to bring Doctor Who joy to Christmas. Missy is part of Doctor Who right now and that is why it should be part of your holiday decorations so come check out this Missy ornament. 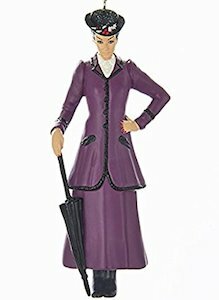 The ornament of Missy is 5 inches tall and shows a really detailed character and she is wearing her classic purple outfit complete with hat and umbrella. So now besides the Doctor, you can have an other time lord in your tree. And as Missy does not look too Christmasy you could have her hanging around all year long. The Missy Christmas ornament is made from durable resin so that it can last for a long time. What does a Christmas from a Doctor Who fan need? Yes, it needs a Tardis ornament and now there is one that looks like a gingerbread Tardis. The glass ornament is made by Kurt Adler and he is famous for making amazing ornaments. 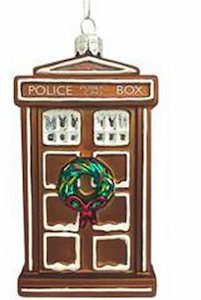 The Tardis is 4 1/2 inch and looks like a yummy gingerbread cookie and it has all the details from the Tardis and it looks like it is icing that made them and on the door, you also find a wreath because it is a Christmas ornament. 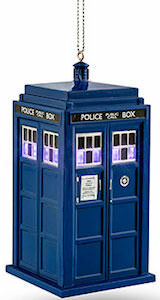 Your Doctor Who themed Christmas tree will look so amazing when you add this Tardis ornament. This year your Christmas tree can have a Weeping Angel from Doctor Who in it but this is not an average Weeping Angel no this is one that looks like the Statue Of Liberty and that means that it is awesome. And this ornament is not only great for Christmas, you can use it all year long and then when Christmas comes you give her the space she deserves in the tree. The Weeping Angel ornament is 5 1/2 inches tall and looks stunning. So we know not to blink and I would remind myself if you get this Statue Of Liberty Christmas ornament. A Christmas tree would not be the same if there where not lights and if you are a Doctor Who fan then now you have the opportunity to add some light to your tree. This Christmas tree ornament is the Tardis and it looks just like it all 3D and with all the signs and if you look closely at the windows you notice that there is light inside the Tardis. Yes the Tardis windows of the Christmas tree ornament have lights and not just any color they actually cycle through red, green, yellow, blue and violet so that it feels like the real thing. And yes you can turn the lights off so that the Tardis can be dark at night when we sleep. If you are looking to design the perfect Doctor Who Christmas tree this year then of course you need some of the famous villains of the Doctor. And this Christmas ornament set includes two of this villains. 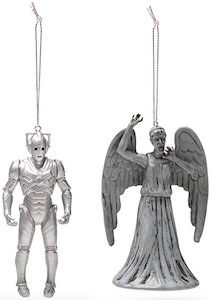 You will find a Weeping Angel and a Cyberman in the set and both will look great and scary in your Christmas tree. The Doctor Who ornaments are 4 1/2 inch tall and would look stunning in your tree. The Cybermen are silver and the Weeping Angel are grey and that makes them to blend in perfectly with almost any color theme you choose for your Christmas tree. What is missing in your Christmas tree? Maybe it’s Davros. 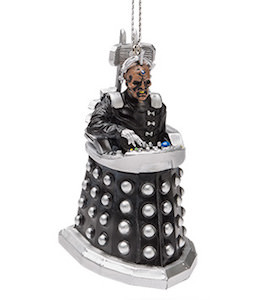 If you are a true Doctor Who fan with a tree that has Doctor Who details then this Davros Dalek ornament could be a great addition. Of course I can’t say if Davros really is into the holidays but hey he can’t go anywhere as he hang down on a string. And this creator of the Dalek measures 3 1/2″ tall x 2″ wide x 2 1/2″ deep and that does not make him look that scary. 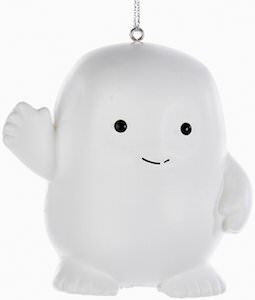 You Doctor Who Christmas tree would be bare without this ornament so why not have one added.